Communion Clubnight is the brainchild of Mumford & Sons keyboard player Ben Lovett. He’s been gearing up the Clubnights across 9 different cities for the past few years now, trying to incorporate a grassroots feel to a small tour involving live music, DJ’s and local pop-up shops in the cities hosting the events. St. Paul’s event will include artists such as Mikhael Paskalev and Count This Penny, with support from Peter Michael Miller (We Are The Willows). Mikhael is a Norwegian singer songwriter who counts Paul Simon, The Shins, and the Mamas and the Papas. Madison band Count this Penny will also be performing, who is no stranger to the Twin Cities, a folk rock four piece band who has found success after leaping to the top of the iTunes singer-songwriter charts with their debut EP. Bring your cowboy boots or dancing shoes as this show is going to have something for any local music fan tonight at the Turf. Thursday night is comedy night at the Turf this week. Taking the comedy circuit by force, Gary has been hitting the late night shows recently, performing on Conan in just the past few weeks, he is famous for his successful runs on Last Comic Standing. He also attracted a much larger audience as the support for Dane Cook’s Tourgasm in which him and other up-and-coming comedians were featured. He is known for his clever takes on absurd and daily occurences in life. If you haven’t seen a stand-up show at the newly remodeled Turf Club yet, here is a great chance. Tickets still available for his late show! See you there. Sounds like: Jay Leno, Dane Cook, Louis C.K. Sam Roberts has gone into uncharted territory with his newest release, an experimental electro-rock sound that can be attributed to their listening of Death From Above 1979 recently. Another half can be attributed to their work with infamous producer Youth, who has a long list of projects, including Bittersweet Symphony and Paul McCartney’s band The Firemen. Roberts is famous for his songwriting prowess, effortlessly penning tracks that can be full out disco songs or psychedelic and dreamy tunes. Canadian indie rock group The Besnard Lakes will be co-headlining, famous for their Godspeed You! Black Emporer influences and full-out shoegaze rock, being nominated for the Polaris Prize twice now. It’s sure to be a wild time this Friday night at the Turf. Portland folk-rock outfit will be returning to the Twin Cities this weekend, playing their fourth show here since 2011. Local crowds have loved their resemblance to their Midwestern folk sound of Yonder Mountain String Band, Trampled By Turtles, and others. Frontman Justin Ringle is an acoustic guitar savant, and was paired up with multi-instrumentalist Peter Broderick in 2005, and the former Horse Feathers became the new, fleshed out Horse Feathers, with a much more full and vibrant sound. The band later added Ringle’s sister on violin, and recorded their newest effort, So It Is With Us on a farm in Oregon, helping them clear their minds and approach the newest recordings with fresh ideas. They will be performing their newest material for you this Saturday night at the Turf. 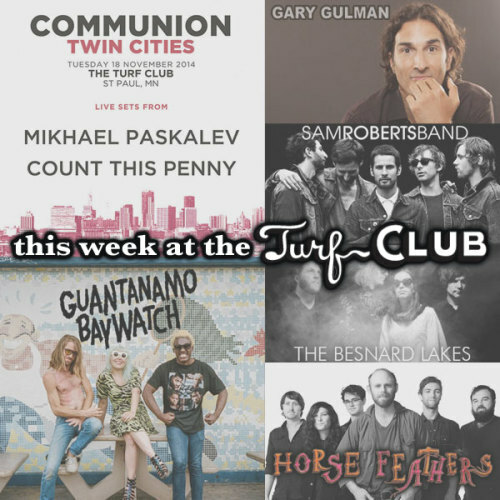 Back-to-back Portland groups at the Turf this weekend, with Guantanamo Baywatch headlining the night after Horse Feathers. These groups may have come from the same city but couldn’t be more different in terms of sonics. Guantanamo Baywatch could be described s thrash-punk AM radio surf rock. If that is too much of a mouthful, maybe you will prefer their handful of southern-style jangly tunes. Guantanamo Baywatch refuses to be defined as any set genre, and this Portland cult group is destined to only grow further, as their extremely high-energy live shows are unrivaled. Don’t miss this eclectic group Sunday night at the Turf!